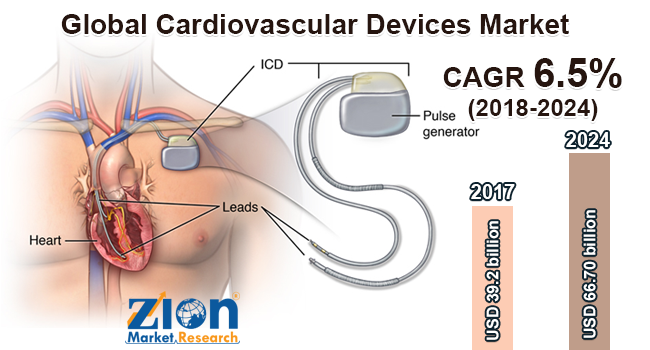 With the presence of a large pool of participants, the global cardiovascular devices market is displaying a highly competitive business landscape, finds a new research report by Zion Market Research (ZMR). Aboimed, Inc., Abbott Vascular, Biotronik SE & Co. KG, B. Braun Melsungen AG, Cardinal Health Inc., Boston Scientific Corporation, Cook Medical, Inc., Cordis Corporation, GE Healthcare, and JOHNSON & JOHNSON are some of the key vendors of cardiovascular devices across the world. These players are focusing aggressively on innovation, as well as on including advanced technologies in their existing products. Over the coming years, they are also expected to take up partnerships and mergers and acquisitions as their key strategy for business development, states the cardiovascular devices market study. Citing an instance, on October 22nd 2018, U.S. FDA approved Abbott Laboratories’ HeartMate 3 Left Ventricular Assist Device for treating patients who are not eligible for heart transplantation as a result of advanced heart failure. Reportedly, these devices are predicted to provide life-saving support to the patients with heart failure. As estimated in this report, the global cardiovascular devices market stood at US$ 39.2 billion in 2017. Witnessing a tremendous rise during the period from 2018 to 2024, the revenue in this cardiovascular devices market is expected to reach US$ 66.70 billion by the end of the forecast period. The main products available in this cardiovascular devices market are Cardiac Diagnostics & Monitoring Devices, Electrophysiology Devices, Peripheral Vascular Devices, Interventional Cardiac Devices, Cardiac Rhythm Management, and Cardiac Prosthetic Devices. Among them, the demand for Cardiac Diagnostics & Monitoring Devices is relatively higher and the trend is anticipated to remain so over the next few years, notes the cardiovascular devices market research report. “Large-scale occurrence of cardiovascular ailments across the globe resulting in massive demand for minimally invasive surgeries is anticipated to spur cardiovascular devices market size,” says the author of this cardiovascular devices market study. Apart from this, the product finds spectrum of applications in healthcare sector and hospitals. High equipment costs and stringent government regulations, however, are likely to act as a restraint for cardiovascular devices market in the near future. Nevertheless, current research & development activities along with mammoth investments in the cardiac sector are anticipated to generate lucrative growth avenues for cardiovascular devices market in the forthcoming years. Regionally, North America has been leading the worldwide cardiovascular devices market and is anticipated to continue on the dominant position in the years to come, states the cardiovascular devices market study. Humungous presence of obese population along with increase in the disposable incomes of the consumers is the key factor behind the dominance of the North America cardiovascular devices market. The high number of market players being headquartered in North America is another significant factor that is likely to support the growth of this regional cardiovascular devices market. In addition, well-developed healthcare infrastructure, huge investments in research and development activities pertaining to cardiovascular device production, and increasing intake of junk food will further enlarge the business scope across the region.